I moved into my house during Memorial Day weekend, at the end of May in 2001. I knew the house very well already – we bought it from my parents. It wasn’t the house I grew up in, but rather the house they built after all of us, well almost all of us anyway, had left home. The house was about seventeen-years-old when we bought it. It’s a great house and I love it. But from Day One of my ownership of and living in this house I have wanted to remodel the bathrooms. There are two of them – a main bathroom shared by the family and guests, and a separate full bath for the master bedroom. Sounds luxurious doesn’t it? Yes, it’s nice to have the separate bath and all, but both of these rooms were built to absolute minimum code to pass the inspection. These are very small bathrooms, very small indeed. And while they were decorated very nicely (by my Mom who was an interior designer and was IN LOVE with wallpaper), they just weren’t what I wanted. Unfortunately what I wanted and what I could afford were two different things, and here we are, almost thirteen years later and I STILL haven’t done my bathroom remodel! Well my friends, the time is coming. For the last three years, we’ve been renting out our house because we’re living on the other side of the world (see Adventures), but this summer I’m coming back home and moving back into my house. And the FIRST thing on my list is to see about doing these bathrooms. Watch this page for updates and news about this exciting (for me, anyway) project. This will be a small-budget remodel of two bathrooms. Luckily they are back-to-back with a single wall separating them, so plumbing is centrally located, which I think is kind of important. 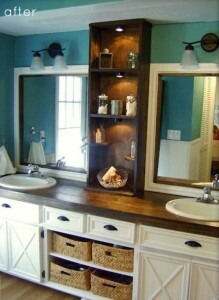 If you’ve done a bathroom remodel and have any tips or suggestions, I’d love to hear them. I can’t post “before” pictures right now because, as I said before, I’m on the other side of the world. So here are a couple of pictures of ideas that I like. Might as well start planning, right?! 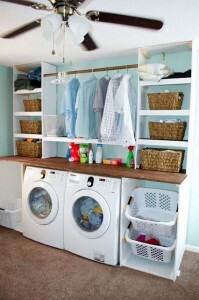 SUCH a good idea to have washer/dryer close to bedrooms. After all, where is dirty laundry generated? Two sinks in bathroom good, too. In one house where I lived, the Master bath was at the opposite end from the water heater, so we installed a small unit under the bathroom sink so face washing was hot instantly (although it still took a while for shower to heat up). Consider an instant water heater in bath for shower and sinks. Small space, instant hot water, no keeping water hot when you don’t need it. I agree, Jacque! I’ve never understood why the washer and dryer were located so far away from the bedrooms in the house. Definitely considering an instant water heater for this area as well. Thanks for your suggestions and comment!